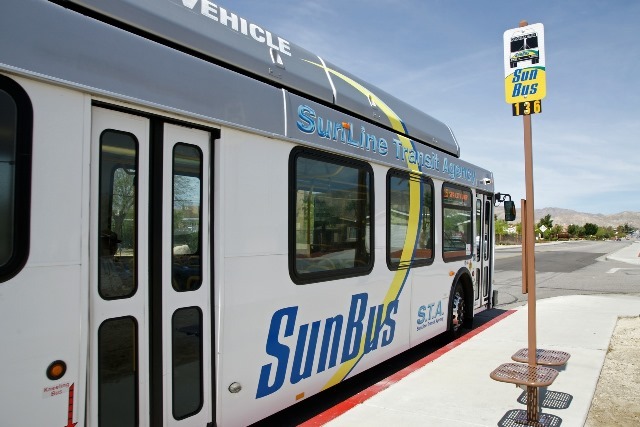 Thousand Palms, CA – March 19, 2013: SunLine Transit Agency is pleased to announce the installation of the first two (2) Simme seats at bus stops throughout the Coachella Valley. The Simme (pronounced sim-ee) Seat is designed to fit at stops where a transit shelter can’t be accommodated because of a lack of space or stops with lower usage. Providing passengers with some seating at these locations will improve the rider’s experience. The Simme seat is a good solution that maximizes space by offering seating for two (2) customers, as well as incorporating the bus stop sign and route schedule. An additional twenty two (22) Simme Seats have been purchased from Simme LLC of Eugene Oregon and will be installed over the next few months throughout the Coachella Valley. SunLine Transit Agency is a joint powers authority formed in 1977 to operate the Coachella Valley's public transportation system. Its vehicles travel more than 2.8 million miles per year, covering over 500 bus stops located throughout a 1,120 mile-service area carrying approximately 4.5 million riders. SunLine offers fixed route bus service and curb-to-curb paratransit for the mobility impaired.